The new Akiles Crimp@Coil double-sided electric coil crimper is designed to speed up the coil binding process for your organization. In fact, the Akiles Crimp@Coil is an easy to use electric coil crimper that cuts & crimps both sides of your document at the same time. Unlike any other automatic coil crimper on the market, the Akiles Crimp-A-Coil can handle coil that is between 6mm and 50mm without having to change any parts or install a new set of crimping dies. In fact, with a simple 5-step setup process, you can change the coil or sheet size settings in just seconds. The Akiles Crimp@Coil is an ideal solution for high volume binding facilities and in-plant print facilities. Just imagine how much time you could save if you didn't have to crimp every document by hand using a pair of coil crimping pliers. Electric Double-Sided Coil Crimpers with adjustable knives: Avoid manual coil crimping process and improve productivity. Works on Full Range of Coil Sizes: Quickly and easily crimp all coils sizes (from 6mm to 50mm). Adjustable Crimper Heads: No hassle of switching crimper heads for different sizes. Simple Five Step Setup: Only takes seconds to change coil or sheet size settings. Special Coil Alignment Guides: Ensures a perfect, consistent result in every crimping operation, by guiding your coils in a well-centered position to the knives. 54 cycles per minute: Fastest cycle speed in its class, higher productivity. This machine performed flawlessly. We do 200 to 300 books at a time. We were doing them with the crimping hand tool. When we got this new unit it cut the time from a few hours to 40 min. A great time saver and it does a great job. Crimp n coil Review by Denise B. Easy set up just like the advertisement says. Quality is very good. Welcome to MyBinding video. Today we're looking at the Crimp-a-Coil, an Akiles heavy duty, automatic coil crimper. Certainly one of the most frustrating parts of coil binding is crimping the ends for a nice finished look. The Akiles Crimp-a-Coil allows you to crimp both ends at the same time consistently through any number of projects. Here's the set up step-by-step. Two knobs on each plate allow you to loosen or tighten them down. Opening them up, use the grid. You can match any size paper or bind that you need. You can also lock in your setting by placing the book inside, between the fence bars, and lock it down. The large black knobs on either side of the machine raise or lower the entire shelf. This is the first adjustment you make for the size project or size coil that you're working with. Use the guide to set your setting and use the same setting for both the crimpers and the guides there. After the guides are set, you'll need to place both crimpers in the right spot so that you hit the coil at the right place. On the back of the machine behind the crimpers are three locks. Unlock them and that allows you to relocate the crimpers wherever you need. It's a little bit of work to get it perfect but once you have it set, it's set for all of your projects. And you always want to crimp just on the inside of the first ring. And remember to lock down your settings. When you're all set, use the black pedal, either by foot or by hand, and crimp away. The Crimp-a-Coil will cut and crimp both ends simultaneously. And the finished product is as nice as it is easy. The Crimp-a-Coil will allow you to crimp over 50 books in a single minute. The nylon black bag in the front is easily removed and inside holds all your trimmings. There it is, the Akiles Crimp@Coil. For more demos, reviews, and how to's on this product and many more, check out MyBinding.com. When it comes to the spiral coil binding process, the very last step is one of the most important. Crimping the ends of the binding helps to ensure that the spine stays on the book where it belongs and doesn’t spin itself off. While it is a fairly simple process even when done manually, if you are working with a high volume of books, it can be somewhat of a time consuming task. The Akiles Crimp @ Coil is a machine that automatically cuts and crimps the ends of the spiral coil wire far more quickly and easily than it can be done with hands and pliers. We recently took a close look at the Crimp @ Coil and are here to report what we see as some of its strengths and weaknesses. 1. Versatility. The Crimp @ Coil is a pretty impressive unit, as it is set up to crimp coils of just about any size from 6mm to 50mm thick. One thing that you will also appreciate about it is that you will not have to make any sort of physical adjustment to the machine or change any sort of die to crimp coils of different sizes. All you have to do is to select the correct setting for the coil you are using and you are all set. This is a refreshing change from the vast majority of the other crimping machines on the market. 2. Speed. Speed + accuracy = productivity, and with the ability to cut and crimp fifty booklets a minute, the Crimp @ Coil impresses with in this realm as well. The motor operates at 54 cycles a minute making it one of the fastest automatic crimping machines out there, which means that it presents a good solution for just about any heavy duty document production environment. 3. Durability. Just like most members of the Akiles line, the Crimp @ Coil is constructed entirely of high quality metal, and is by all appearances, a machine that was built to give you years of great service. This, of course, heightens the appeal the machine may have for large volume users such as professional binderies, copy and print shops, and larger businesses that do their own in house publishing. use of hands. This both increases the accuracy of the machine, and helps to ensure that hands stay free of the cutting and crimping mechanism where they might be injured by careless operators. 5. Convenient. The waste bag of the Crimp @ Coil is both large and easy to empty. 6. Accurate. The Crimp @ Coil’s alignment guide makes this a very easy to use machine, and helps to ensure that your books are always correctly positioned for crimping. 1. The Crimp @ Coil is designed for use by large volume production environments, so the financial outlay may be a little much unless your business can be described as such. 2. This machine weighs in at around 50lbs, so you might need some help moving it around the floor, or you might want to find the machine its own dedicated spot. 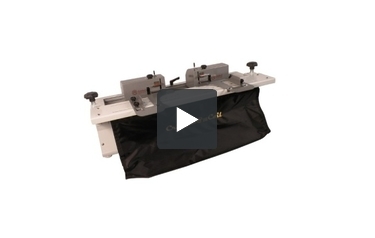 If you are interested in more information about Akiles Crimp-A-Coil Automatic Crimper, you might want to visit MyBinding.com. They offer a great price on binding equipment and they even offer Free Shipping on orders over $75.00. Plus, they carry a full line of Binding Supplies, of all types and capabilities. Check it out today! What is the minimum width sheet size that the Akiles Crimp@coil can do. We have projects that run in the 4" range that we would like to automate. Thank you for your question. The Crimp@coil can crimp from 6" to 17" width.